The Boston Symphony Orchestra said last night that Charles Dutoit would ‘no longer appear as a guest conductor’ following sexual assault allegations by four women. The Chicago Symphony said: ‘In response to the allegations about conductor Charles Dutoit reported in the media today, Mr. Dutoit informed the Chicago Symphony Orchestra Association (CSOA) that he has withdrawn from conducting concerts scheduled for March and April. The CSOA is committed to maintaining a workplace that is free from intimidation, coercion and harassment, including sexual harassment. 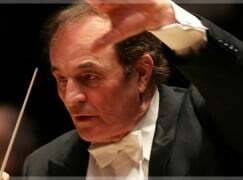 Dutoit had been planning a US tour to mark the anniversary of a historic tour by Maurice Ravel. He has not made any official response to the allegations. Other orchestra cancellations are coming in from the Sydney Symphony, San Francisco and more. He has withdrawn from Cleveland. Not a word from Montreal. Isnt it top Quick? To loose his job in 24 hours. I think yes. The time for the investigators to do their job. It exist some laws. To allowed an answer. Until he’s found to be guilty? Yes, maybe. But I dont believe that come only by himself. I think that’s an arrangment. Emoji’s displaying frustration and irritation not displayed in my original reply. Yes, it’s an old refrain, but maybe someday it’ll be heard. The time for the investigators to do theirs job. It sem’s like if the orchestra would throw of his conductor. The public seems to get used to totalitarian rule of the accusation. What happened to due process? Rule of law? This is like gladiator fights in the Colosseum of ancient Rome, Cesar looking around what the mob wants, thumbs up or thumbs down. Scary times. All the laws we need to investigate and bring this to trial are in place. Why not use them? Exactly. Infortunately the « laws’ people » seem becoming the new law. ‘Guilty until proved innocent’….! This seems to be a perversion of justice. Sounds like this was another “open secret”. My guess this was allowed to continue as no one apparently complained until now. I agree that the BSO should take a look at its work environment, especially during recent years in which both Levine and Dutoit were fixtures in Boston and Tanglewood. But the cynical, self-preserving approach is to keep the focus on the perps– virtue-signal by dispatching them forthwith, while hoping the scrutiny shifts elsewhere. Merry Christmas for each One. Simply super!!! Bravo. Next?!? Go on. In more breaking news, Boston’s Handel and Haydn Society has severed all ties with Franz Joseph Haydn, who for years was unfaithful to his wife, and who kept a mistress on the Esterhazy payroll. “What a bunch of losers,” remarked the H&H Executive Director. Haydn’s music has been replaced by that of Richard Strauss, whose faithfulness to his wife was well-known and completely unreasonable. I’m surprised you all seem to think that sexual assault – or even “alleged sexual assault” is a laughing matter. And then you wonder why the victims of abuse so often stay silent rather than face public humiliation. Humor is criticism in its highest form! Get some. Totally agree with you,Stephen. These events are very difficult because of the time which has lapsed between the alleged incidents and the present. However there is a need for all the allegations to be followed through in a timely manner with the highest levels of integrity by all parties. The sensationalist reporting is not helpful, neither is the low quality of many of the comments in this blog. A bit of humanity and understanding would not go amiss. The very fact that all these orchestras are throwing him out so quickly is likely due to the fact that they knew about his sexual misbehavior tendencies and are trying to cover themselves before any of this turns into an investigation of legal event. And for some here who still defend the “guilty before proven innocent”, and seel saddened that he “lost his job in one day”, be aware that there are lots of people who lost their jobs “in one day” because they said NO to ANY kind of abuse from people addicted to power. These people also need protection and recognition and justice at one point, which most will never get. This frenzy is quickly devolving into insanity. John Hathorne would be proud. “Not a word from Montreal” except for the fact that there has, in fact, been a word from Montreal: http://www.ledevoir.com/societe/justice/516078/charles-dutoit-reactions-a-montreal. Also, Dutoit has not conducted the OSM since 2002, except for an exceptional one-off concert in 2016, and is not expected to conduct in Montreal – pretty much ever, so I’m not sure why you would expect a statement from the OSM that they have banned him from the orchestra, as there are no concerts from which to ban him. “The current management [the general director, Madeleine Careau, who has been in office since 2000] has never received any complaints or testimonies concerning sexual misconduct on the part of Mr. Dutoit with OSM musicians.” indicated to the Duty the head of the public relations of the OSM, Pascale Ouimet. But, following allegations reported Thursday by the Associated Press (AP), the institution “does not close the door to a verification of cases of misconduct or harassment concerning the musicians of the OSM under the artistic direction of Mr. Dutoit, “added Ms. Ouimet. No mention of guest soloists, or conduct outside of the OSM. What pisses me off most is,that,based on allegations made public.institutions place themselves above the law and decide which performers i am allowed to listen furthermore and which not to.Personally i was looking forward to a lot of Dutoit´s performances,especially of the french and russian masters.Thanks to this kind of infantilizing i can forget about this. Today i had an appointment with my lawyer.He said he feels disgusted about how easily and readily people in this case ignore some basic principles of our law system.He would advice Dutoit(and Levine,too) to step forward and sue the accusers for libel.Than everyone has to put the cards on the table.If Dutoit did commit those allegations,the ladies should go ahead and file a lawsuit against him,instead of just making headlines. If not,then there´s no reason to discuss it any further,for lack of legal justification. Well, ask your lawyer about the difference how a criminal offense or misdemeanor and a civil lawsuit are handled by the law. The accusations are about criminal acts or misdemeanors. You report those to the police, not file a (civil) lawsuit. Exactly.But apparently,the alleged victims didn´t report anything to the police,they just reported to CNN and some other media outlets.So what now? Now we’re all wondering what you were meeting with your lawyer about. But,understandably so,there will be many jumping the bandwagon now,having found out how easy it is to destroy a career by dropping a few rumours.And maybe even getting a big break…My father told me stories about good old Joe McCarthy,and how it worked…. It’s common practice in workplaces to suspend the accused whilst a criminal investigation in underway. That’s exactly what is happening here. Whichever part of that you don’t understand I don’t know. Judging by all your comments you live under a rock. But he is not suspended, he is fired immediately, based solely on unproven accusations. Women never lie or settle scores, do they? In any case, it’s absurd to fire a reputable worker just based on ANY UNPROVEN accusation only. Had he been suspended it would feel differently. People. Please a little order in this chat room! Charlie Rose and Charlie Dutuoit are going to be roommates in rehab together according to an inside source that is not going on record. Bathrobes are provided as well as massage oil. They can expose themselves to each other and discuss Classical music and favorite recordings. Hahahahahahahaha, that’s actually pretty funny. Extra, extra: famous conductor dropped by orchestras right and left over sexual misconduct accusations — 22 years after @ottawanag described the very same behavior in an article that made quite a stir, but that was evidently soon forgotten.